I wrote an article recently explaining the basics of geodesic dome frequency, in that article we looked at an icosahedron as the origin of most geodesic domes and some of the basic theories of dome frequency. The conclusion drawn was that the bigger you build a dome the higher the frequency needs to be. When designing domes I find that 2v geometry is OK for domes up to 4 meters diameter (13 feet) after that the triangles get to big and it can be difficult to find stock sheet material to fit very large triangles, so what we do is go up a frequency to 3v, OK we have to fix the flat bottom issue with 3v domes but we can now go up to around 6 meters diameter (19’6”) before the triangles again get to big. So why can’t we just keep going up in frequency? Take a look at a full 3v dome converted to a pseudo-6v dome. Simple geometry, if you can build a 3v dome you can easily add three new struts to each panel and convert it to a pseudo 6v dome. You could do it after you’ve built a 3v dome to increase strength. 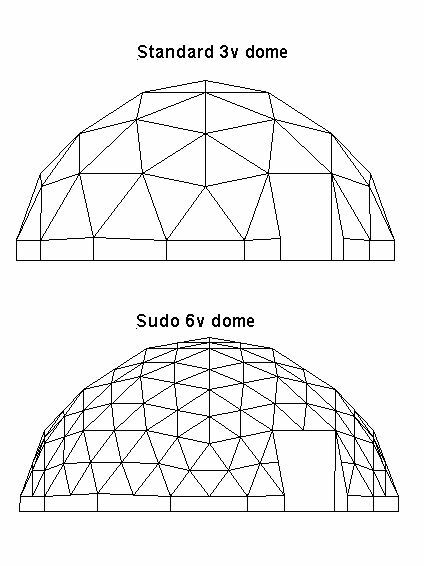 You can build much bigger domes, 11 meter diameter (36 feet) is no problem using pseudo 6v geometry. Much less likely to get hub inversions on very high frequency domes. Fitting door openings in a pseudo 6v dome is just as easy as in a standard 3v dome, while fitting door openings in a true 6v dome is a mathematical nightmare! With conduit style domes you will need to flatten a section in the middle of each strut as well as the ends. If you’re using hubs and struts to build your dome you’ll need to make half hubs that fit in the middle of each strut, and lots of them. I would emphasize on the fact that the 3v dome structure should be completed before the additional half struts are added, only to make the triangular sheets half the original size and hence easier to obtain. If you also want to halve all the strut lengths, I'm am skeptical of the rigidity of a pseudo 6v, since there are flat parts, i.e. the shape is not strictly convex, when convexity is the key factor that makes domes rigid. Also, I think there's a typo in the image (sudo for pseudo). Nice ideas in this site! How complex would it be to build a 50' diameter dome using this technique? Could it be done using 4V instead of 3V? I think you may over estimate the cost of solar and wind. Also cenoidsr he paid less for the house itself ($80k max, as opposed to what $150-$300 depending on where you live). From what I remember solar systems to cover a traditional homes cost about $30k. Domestic one family home wind systems can cost anything between $8-15k (for a fancy one) so all in all I don't see this dome home and the systems would cost more than an average home. I'm sure he's done a lot of itself as well. In fact, didn't he say he built his home this way because he didn't have the money to build a traditional home . I think this former firefighter is Mr Average in terms of economic capability, perhaps even Mr Below Average.